Toilet cleaning is one of the important parts of house cleaning, there are many approaches to it and it requires a lot of time. To save your time and energy and to show you the proper way of cleaning toilet in this tutorial I want to describe toilet cleaning method used by Glossy Clean in our every day house cleaning routine. Before starting cleaning the toilet please make sure you are wearing gloves which will protect your hands from chemicals used for toilet cleaning, also be very careful with liquid cleaning supplies they can irritate your eyes and skin. For effective toilet cleaning we will need liquid toilet cleaner such as Clorox Toilet Bowl Cleaner or Lysol Power Toilet Cleaner. Also we are gonna need small bucket with clean watter, toilet brush and sponge for scrubbing inside and out side of the toilet bowl. For wiping the toilet we are gonna need couple of soft rugs. First and most important thing to do is to pour some toilet bowl cleaner in the toilet bowl and spray the out side of the toilet bowl with the toilet cleaner and let it sit for 15-20 minutes. It will softer up all the dirt on the toilet bowl and kill all the bacteria on it. Start from the inside of the toilet bowl and scrub it with the toilet brush and toilet cleaner and then flush the toilet couple of times, repeat the procedure until inside of the toilet is clean. Next put some water in the bucket and mix it with your toilet cleaning product. 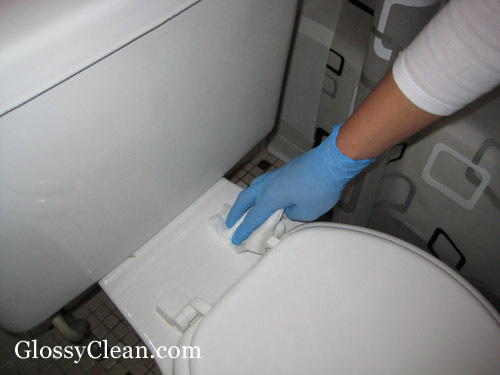 Using sponge or a soft rug dipped water and toilet cleaner solution scrub the toilet tank clean, the seat cover, the seat itself and then the rim of the toilet. After this do the same thing to the outer bowl, the base of the toilet and behind the toilet. After you finished scrubbing wipe all the areas with clean water and clean rug and after this use a new rug to wipe the toilet dry.